In the last and most deadly plague, the firstborn of Pharaoh was striken dead like the others. Pharoah's stubborn heart was crushed to the very dust; he could struggle no more. He called for Moses and Aaron and told them to take their people and go forth from Egypt. 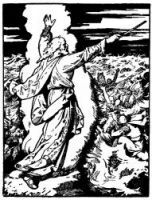 In haste and joy, six hundred thousand Israelites gathered themselves and their possessions and passed out of the sore stricken land with Moses leading them southward towards the Red Sea, marching as an army in triumph. 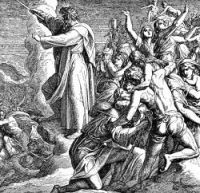 The advance of the Israelites down the Egyptian shore of the Red Sea kept them still within Pharaoh's reach. When he heard of the opportunity thus offered, his rage and hatred grew within him. Suddenly he resolved to avenge his son; he summoned his armies and pursued. Moses kept a weary vigil through the night. 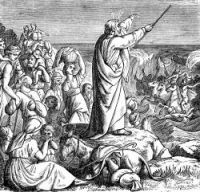 The Red Sea Crossing had been chosen by God as the place for the final punishment of the Pharaoh and his people. God bade him stretch forth his rod over the sea. The Lord caused the sea to roll back revealing dry land, and the waters were divided, allowing the Israelites to make the Red Sea crossing. But the relentless Egyptians followed them. As they sped across the sands of the sea's bottom, the wheels began to break from their chariots; they saw their doom. 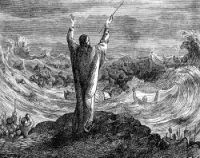 Moses stretched forth his hand over the sea, and the sea returned, covering the chariots, horsemen, and all the host of Pharaoh, while the children of Israel walked upon dry land in the midst of the sea. On this page you'll find nine images of the Red Sea Crossing of the Israelites as they flee the Egyptians. 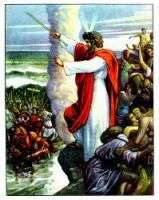 The illustrations of the Red Sea Crossing are taken from my collection of antique Bibles and story books. You're welcomed to use these pictures in your designs. Click on the Red Sea Crossing drawings below to see more details about saving a free Red Sea Crossing image or about purchasing the images of the Red Sea Crossing at a higher resolution.